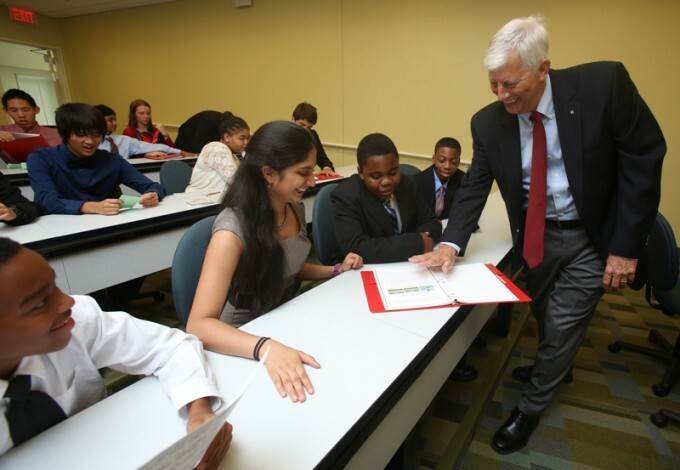 During the summer, local teens will have the opportunity to explore future career options during the EXPLORE summer camps at the C. T. Bauer College of Business. Local teens will have the opportunity next month to discover possible future careers while exploring the University of Houston campus during a series of summer camps at the C. T. Bauer College of Business. Bauer College’s EXPLORE summer residential business camps give selected high school freshmen and sophomores the chance to learn more about industries that are on the rise, including entrepreneurship, sales and marketing, and energy and sustainability, with sessions led by Bauer faculty, staff, students and partners. “The camps offer students the opportunities to discover and learn about the many different majors and careers that can be pursued in the business arena,” Undergraduate Business Programs Program Director Joyce Williams said. Last year’s Sales & Marketing EXPLORE students had the opportunity to take a tour of the Toyota Center, home of the Houston Rockets. “Students are also able to get a feel for college life by staying in UH dorms as well as interacting with a diverse group of Bauer students,” she added. Campers will work in teams on experiential learning activities, honing their presentation and communication skills before meeting with a local CEO to get a perspective on starting a business. EXPLORE will kick off in early July with a focused session on entrepreneurship, followed by sales and marketing, and ending with a week of study in energy and sustainability. Hosted by Bauer’s Cyvia and Melvyn Wolff Center for Entrepreneurship, participants will spend time with seasoned entrepreneurs to learn how to start a business from the ground up. They will also have hands-on experiences from elevator pitches to implementation. Participants will have the opportunity to work on teams, perfect presentation skills and explore what makes them stand out among their peers during this session, led by faculty and staff from Bauer’s Sales Excellence Institute (SEI). This session will explore topics on the city’s largest economic driver, energy. Participants will investigate the global implications of scarcity in oil and possible alternative energies, along with the future of the industry.